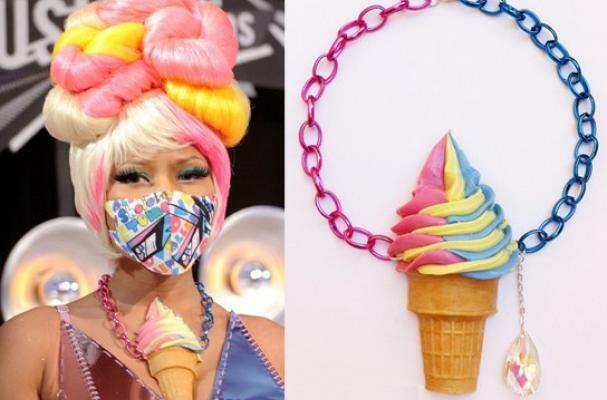 If you watched the MTV video music awards, it was hard to miss artist Nicki Minaj in her colorful and quirky outfit. The one piece that stood out was her soft serve swirl necklace. This necklace is part of onch movement's perfectasty jewelry line. In this food-inspired line you will find pretzel necklaces, bacon bracelets, and candy bows. This jewelry is cute but not cheap. The swirl cone necklace is on sale for $79.99, most of the pieces in the collection start upwards of $50. This necklace and other pieces can be purchased online.